How did you become interested in working in information services? As an undergraduate at UC Berkeley, I worked part-time at Moffitt Library as a Student Assistant. I saw how the reference librarians worked with students to help them find information and that interested me. I also took the library introduction course and found a whole new world about how libraries work and decided the information world was for me. I then applied to the UC Berkeley Library School and started my studies right after finishing my undergraduate program. Right before I graduated from library school, there was a glut of librarians in the Bay Area and I was not able to relocate to find work. We had a “job board” in South Hall (where the library school was located) and an engineering firm had called the school looking for a student to organize their library. I called the number, interviewed and wrote a proposal, stressing that I would be graduating in 2 weeks and expected to come onboard as a professional, not as a student. I was hired immediately and began work as a consultant to this engineering firm. I was there for 3 months. Many of their clients saw my work, which led to more consulting, and I had plenty of work to launch my business. What are the services that your clients need? Please describe a job you did. Knowledge Services/Enterprise Content Management: providing solutions to organize intellectual content to make it findable, actionable and reusable. Library Automation: making externally published content findable by reviewing the library collection and organizational needs to recommend the best solution to automate access to library materials to save staff time and frustration. Proprietary Database Research: expert searching of millions of resources on hundreds of proprietary databases not available on the open Web. Information Edge then provides value-added analysis of content found, an executive summary report so the client does not have to comb through thousands of citations. This provides a complete research department at the clients’ fingertips when they need it. It’s difficult to choose one job to share, but this one had lots of interesting elements to it… I was brought in as a consultant for a global architectural firm to assess their current information needs and recommend the best print/electronic software solution to maximize staff efficiency and ease of use. The client has six print and many digital library collections in each of its six offices. (There were many information silos and it was impossible for staff to find what they needed.) They wanted to be able to share, search and retrieve image and file information using an online database. They have an intranet and are using digital assets management software to manage 30,000 digital images. An inventory was needed because they didn’t know what they had in each of the physical nor digital libraries. Information Edge (IE) performed an information audit to determine how staff find information and to ascertain where the pain points were. IE then researched and recommended software solutions and a taxonomy that would maximize ROI for finding information needed by staff to do their work. IE also recommended ongoing staffing needs to keep the system current and assisted with hiring a librarian. As an independent consultant, what is the most important thing you are doing to stay competitive? I try to keep my name and services in front of clients and colleagues (who often recommend my services to others or hire me). I do this by writing in the information professional and target market literature, presenting at conferences and seminars, and networking. I also stay in touch with clients by sending them unsolicited articles or information I think would be of use to them (though I do this only occasionally). I also have a new blog that I hope will provide useful information to my current and potential clients as well as colleagues. What is your favorite (or most productive) tool you use in your work? There are so many Web 2.0 tools that I could mention, such as LinkedIn, but a handy little tool I use when working on client projects is called TraxTime. It helps me keep track of the time I spend on projects and with clients. Those 10-15 minute phone calls and emails really do add up and if I didn’t have this tool, it would be difficult to track that time. What has been your most memorable work experience? There have been lots of them. One that I think is unique comes from my time at the Nevada State Library as the Collection Development Librarian. 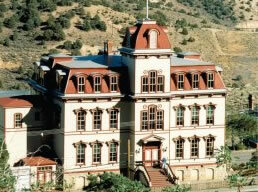 The State Librarian’s office had received a phone call from the Virginia City School District about some books that were in the long abandoned Fourth Ward School, a beautiful structure built in the heyday of the silver rush. It fell to the Public Services Librarian and me to go inspect the building and see what was there. We were both charmed by the beautiful building while at the same time appalled at its horrible condition. Bird and rat droppings were everywhere, but vestiges of the old beautiful schoolhouse were still visible — blackboards with the letters of the alphabet over each one, a few very old desks and worn, but lovely wooden floors. The books were not much to look at but we had a wonderful time seeing this historic old building. It has now been restored. Why do you volunteer for BayNet and other professional associations? When I first started in this profession, I found so many mentors who freely spent time answering my questions and helping me to stretch professionally. In turn, I want to give back to other information professionals. A really good way to do that is to volunteer either in a formal capacity (board or committee member or chair) or informally as colleagues and students contact me for advice. Many of my colleagues whom I have met through my involvement with professional associations have become good friends.